The result is an invigorating version of our popular stout; layered with notes of rustic dark chocolate and bold, fruity coffee beans. 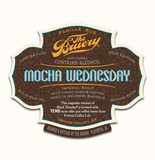 Mocha Wednesday is the perfect follow up to a Black Tuesday. We’ve taken our bourbon barrel aged imperial stout and added cacao nibs from San Francisco based TCHO along with freshly roasted coffee from OC’s own Portola Coffee Lab.